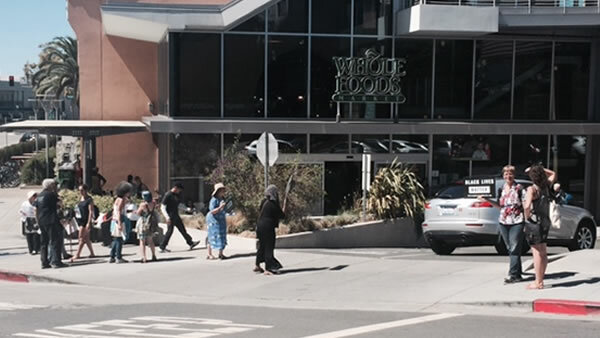 OAKLAND, Calif. (KGO) -- Demonstrators have gathered at a Whole Foods in Oakland this afternoon following a violent confrontation that occurred between a customer and a security guard Thursday night. Police were summoned to the scene at 9:42 p.m. on request from firefighters who were treating an unconscious man at the store, located at 230 Bay Place. A witness said on social media that the customer had been buying groceries with an EBT card, used to distribute food stamp benefits, when the violence occurred. The customer had allegedly made physical contact with a store employee when the guard intervened, Whole Foods spokeswoman Beth Krauss said. The guard in question allegedly slammed the victim against concrete pillars before choking and restraining him and throwing the shopper face down on the pavement, according to one account. Graphic photos were posted online showing the victim bleeding on the ground. That guard has since been barred from working at Whole Foods in the future, and the upscale grocery chain is working with all their security contractors to reiterate the company's code of conduct, according to a statement issued Saturday afternoon by Krauss. "As a result of the violent behavior of the security guard at Whole Foods Market Oakland, we are replacing this security firm in the store," she said. The new firm has been identified as A.G.S. Private Security in Concord. "Much of what's been reported about this incident has alleged that the use of an EBT card had a role in the altercation," Krauss added. "We want to clarify that EBT cards are readily accepted forms of payment at all Whole Foods Market stores." Police confirm they are also investigating the assault.